Skysuites@Anson developed by Allgreen Properties is coming into the CBD market with a huge bang! Being one of the tallest residential building in Tanjong Pagar, Skysuites@Anson will be the most iconic development that will reshape the city skyline. Offering magnificent views of the CBD, Marina Bay and upcoming new waterfront district, this stunning structure will light up the entire night sky with its glorious illuminated sky terraces. Every residence provides stylish fittings and quality finishes as well as carefully planned hidden solutions and spacious cabinets. All designs are exquisitely selected with the city dwellers in mind. Imagine a kitchen that can be tucked away from sight when not in use, providing efficient yet stylish design. Located in the heart of the CBD, Skysuites@Anson lets you move to the pulsating beat of the city. Indulge in many exciting entertainment and leisure amentities nearby such as Marina Bay Sands, Clarke Quay and Sentosa. Revel in an eclectic mix of quaint bistros, sophisticated nightspots and superb dining choices. 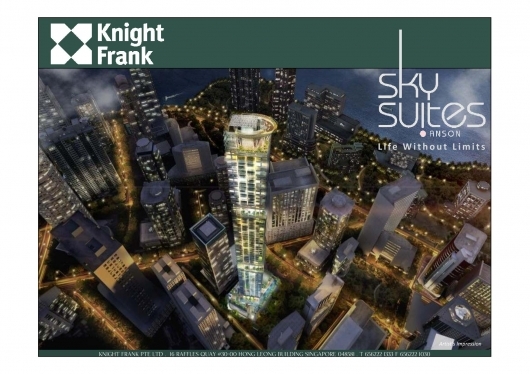 Most importantly, Skysuites@Anson is only a 3 minutes walk to Tanjong Pagar MRT. Call Developer Sales Team for E-brochure & Booking NOW! Following the 1 day sell-out success of 76 Shenton and PS100, this proves that residential development in Tanjong Pagar is highly sought after. You can expect superb capital appreciation due to limited supply of residential development in Tanjong Pagar & also with the development of the new Tanjong Pagar area and Greater Southern Waterfront City. High rental yield with the vast amount of expatriate working in CBD. You can sure profit from the nearby redevelopment of Malayan Railway into a commercial and entertainment belt at your door step and walk from your condo to the new waterfront city within minutes. Interested buyers / investors, please contact Tom Setoh @ +65 91172290 or you can email me @ tomsetoh@gmail.com for more info or register your interest.